If you still believe the Apollo 11 moon landing was a hoax, there’s some footage out there that will prove to you that man did indeed land on the moon (or at least had really advanced special effects in 1969). Long-lost footage of Neil Armstrong descending the ladder of the Apollo 11 lunar module has been discovered in Australia, and it’s considered the best footage of the moon landing ever recorded. The badly-damaged reel was cleaned up and repaired by a team of astronomers and AV experts, lead by Aussie astronomer John Sarkissian, who explains just why the American moon landing signal is so messed up compared to the Aussie version. “NASA were using the Goldstone (California) station signal, which had its settings wrong, but in the signals being received by the Australian stations you can actually see Armstrong. In what people have seen before you can barely see Armstrong at all, you can see something black — that was his leg.” The short segment will be screened at the Australian Geographic magazine’s awards night next week, in honor of Apollo 11 astronaut Buzz Aldrin. “When we heard Buzz was going to be the guest of honour we thought ‘what a great opportunity’,” added Sarkissian. 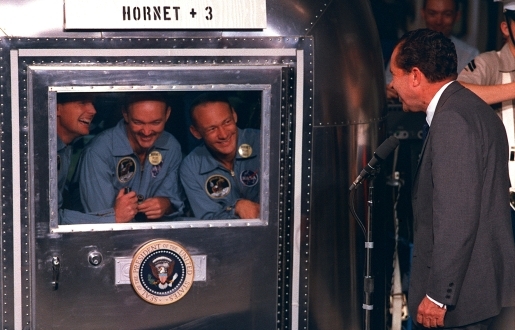 The newly-digitized recording will be screened in the public for the very first time; previously, it has only been seen by NASA staff and the Apollo 11 astronauts themselves.